I trust all families enjoyed their ANZAC Day break and are ready for Term 2 to commence. This morning at our first assembly for the term, we welcomed to the School Lieutenant Colonel Ben Passmore of the Royal Australian Army, members of the Old Boys’ Association (OBA) and special guests. The whole of school event saw the unveiling of a bronze war memorial, and with special guest and old boy Colonel Passmore, sharing memories of his time at Christ Church and life in service. The sculpture, gifted during the OBA centenary year, depicts a mature man and a young boy with the base of the sculpture scattered with poppies, representing the number of Christ Church old boys who served their country and lost their lives doing so. Some photos from this morning can be viewed here. Last night I had the pleasure of hosting the Principal’s Dinner with our Year 12 boys. A wonderful night when we celebrate the boys’ contributions to the School and wish them well for the final phase of their time at Christ Church. Every year we invite two old boys to come and speak, and this year Ben Purcer and Nic Brunsdon attended and shared stories with the boys about their time at the School and provided a fabulous insight into the journey ahead. Both old boys spoke particularly well and I am happy to share with you Nic’s notes for the night, which contain some fabulous points you may like to share with your son(s). All Year 12 parents are invited to the final Parents’ Association sundowner. This casual, social evening will be held in the Senior Staffroom on Wednesday 1 May, the same evening as the Principal’s dinner, from 7.00pm until 8.30pm. The CCGS and St Hilda’s Combined Concert is an annual event and wonderful opportunity for students and families of both schools to get together musically and socially. This year the big five groups will be combined – Choir, Symphony Orchestra, String Orchestra, Concert Band and Jazz Band. The Music Department has a dynamic group of parents who provide invaluable support to the Music program. They are involved in planning and assisting major concerts, helping in the Music library and office and with social and fundraising events. The committee meet at 7.30pm, one Thursday of each month in the Music Department. All interested parents are welcome to attend. Further information about this important support group is available through Karen Sim, Music Administrative Assistant. Click here to view the Music Department’s events calendar for 2019. The Centre for Ethics has been in conversations with the School and outer communities for more than 21 years. The Centre has welcomed speakers from a wide variety of backgrounds – philosophers, prime ministers, theologians, novelists, poets, explorers, members of parliament, educators and leaders who model an ethical way of life, those who work actively to change the world and those who place more emphasis on reflection. Read the latest Centre for Ethics newsletter here. Book Fair is coming to Christ Church! The Scholastic Book Fair is coming to Christ Church and will be arriving on Thursday 9 May, Week 2 in the Preparatory School Library. Boys are encouraged to come down and explore all the fantastic books during Week 2 to write their wish list. Boys will also be viewing Book Fair during their library lessons. Purchasing will be open during Week 3 with special times for parents/guardians to view Book Fair on Thursday 16 May and Friday 17 May from 2.30pm to 4.00pm. Christ Church Grammar School is proud to support the Bindaring Clothing Sale for the Australian Red Cross on Saturday 18 May by accepting second hand clothing donations. If you would like to donate any items, donations can be made between Monday 29 April to Friday 10 May via collection boxes available at the School’s Main Reception, Preparatory School Reception and Uniform Shop* – see campus map here. All proceeds go to Red Cross services supporting our communities in times of need. The Bindaring Sale has raised over $2 million for Red Cross since it began in 1963. For any enquiries, please contact Capucine Flipo at capucineflipo@gmail.com. *Pre-collection available in the Uniform Shop as from Wednesday 10 April. See here for opening hours. The Uniform Shop will be open during the following times, in addition to its standard opening hours. Please visit the Uniform Shop page for more details. Christ Church Grammar School and Methodist Ladies’ College provide shared dedicated bus services that run to and from various suburbs. Our Preparatory School will be celebrating Access Asia Week during Week 4 in Term 2 (20 to 24 May). We are currently seeking parents/friends who may be interested in delivering a talk to our Year 6 boys on their personal experiences and thoughts on the Australia/Asia connection. This may perhaps be someone with business relations to Asia, someone working for an international company or someone who travels throughout Asia frequently. If this sounds like you or someone you know, we would love to hear from you. Please contact Ms Li Liu at lliu@ccgs.wa.edu.au for further details. 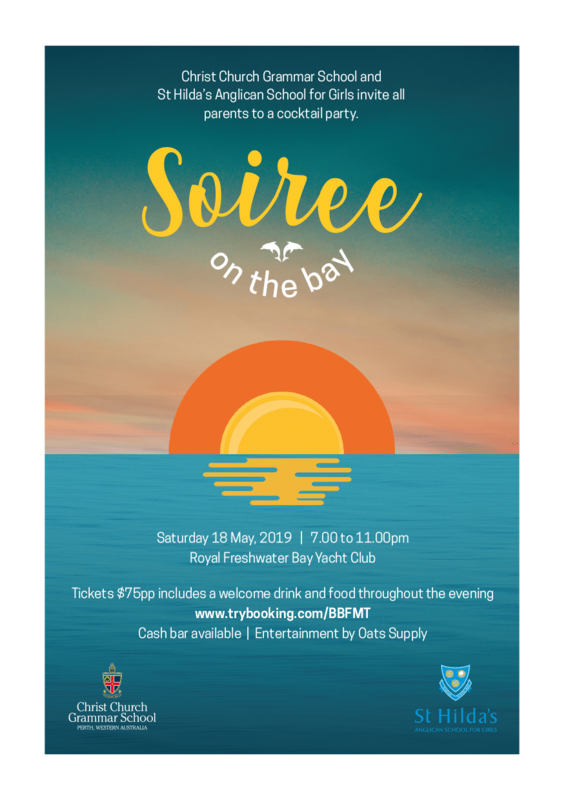 All parents are invited to attend Soiree on the Bay, a cocktail party for Christ Church and St Hilda’s parents. Tickets: Book now $75pp includes a welcome drink, food throughout the evening and great entertainment. All families are welcome to attend the Christ Church Easter Sunday service to celebrate with messages specifically for children, communion, hymns and choral singing. Everyone is encouraged to join in the Easter egg hunt and enjoy hot cross buns at the end of the service. Bounce, roll, twirl and blast your way into the school holidays! With captivating incursions, energetic excursions and innovative play, join the Extend Squad for unforgettable adventures. Book 14 days in advance to receive the early bird rate. Visit extend.com.au to book online and for further information. The Year 3 Representatives would be pleased if you could join us for a Mother’s Day Morning Tea and some Family Fun so you can enjoy catching up with friends new and old. The Preparatory School Cross Country Carnival will be held on Thursday 2 May at the Christ Church Grammar School playing fields in Mt Claremont. The carnival will run from 1.20pm to 2.30pm. All boys are expected to participate in this event and students who are injured are expected to come along and support their House on the day. Boys are to wear their House sports uniform. For more information, including program and course maps, please visit http://sport.ccgs.wa.edu.au/CalendarDay.asp?Id=28729&D=2&M=5&Y=2019. All Year 4 Mums are warmly invited to join us in supporting the Make a Difference Foundation with a High Tea to celebrate Mother’s Day. All Year 5 families are invited for an afternoon of fun at the park. Join us for a Mother’s Day Morning Tea and enjoy catching up with friends new and old. After the success of last year, we again invite the Year 6 community to enjoy Claremont Pizza. Venue: Claremont Showgrounds, enter through Gate 10 on Ashton Road. BYO drinks, picnic rugs/chairs. We also recommend that you BYO soccer balls, cricket gear and other things to keep the kids running on the grassed surrounds while you enjoy a chat, some food and a drink under the teepees. Parking is plentiful at the venue. All Year 6, 7 and 8 parents are invited to a presentation by Ysafe on Tackling the dangers of social media and technology. This presentation will assist parents to manage children’s technology use, including an introduction into the most popular social media platforms and practical tips for keeping kids safe online. It will also cover information on setting boundaries around technology, online behaviour management, and tools for managing technology both in and outside of the home. Blazers can be brought to the Uniform Shop for Summer Awards and Senior Braid from 9 to 16 May and must be dropped off in clean condition during Uniform Shop trading hours. Each Year 7 boy and one parent/guardian only, are invited to attend an afternoon provided by Christ Church teachers, aimed at improving the organisation, note taking, summarising and revision skills of our Year 7 boys (and perhaps providing a refresher for the parent involved). The afternoon is in workshop format, where participants will attend a number of different sessions. It is expected that boys and their parent/guardian will sit together in order to complete the activities. Boys do not need to bring anything with them as everything they will require will be provided. Due to seating limits, only one parent is able to attend with the Year 7 student, and no other family members are able to attend. The same session is conducted on two afternoons in order to allow all Year 7 boys to attend if they wish. Year 7 boarders will attend with their Year Group Coordinator if parent/guardian attendance is not possible. Teachers’ reports on boys’ achievements in Term 1 will be made available to parents via the parent portal in the week following the end of term. Instructions on how to access the report will be included in an email sent home when the reports are ready for download. The Term 1 report will contain teachers’ ratings of your son’s work practices, as well as a grade and mark. Any queries about these reports should be directed to your son’s tutor when school resumes. Mission Discovery will be bringing a NASA astronaut, NASA leader and key scientists (team of about five) to Curtin University (Bentley campus) for a five-day school holiday program from 8 to 12 July 2019. If your son is interested in attending this event you can book online at www.missiondiscovery.com.au. Alternatively, he may wish to get together with a group of friends and organise his own group! Should you require further information, please contact Head of Science Mr Edward Hogg. Year 7 students will be sitting the NAPLAN paper tests on 14, 15 and 16 May 2019. Please find more information about NAPLAN here. The Year 7 interviews are scheduled for Monday 20 May from 3.45pm to 7.00pm. Parents will be advised of the booking process by email approximately 10 days before the interviews. Year 8 Parent/Teacher/Student interviews will take place at the School on Monday 6 May from 3.45pm to 7.00pm. Instructions for making these bookings through the CCGS Parent Portal will be emailed to parents and the bookings will open on Monday 22 April. You will be able to print a booking schedule that gives you the times and locations of each interview. If you do not appear to have received the email by Tuesday 23 April, please contact Ms Emmie Del Borrello, Executive Assistant to the Director of Studies, who will be happy to assist you (telephone 9442 1598 or email edelborrello@ccgs.wa.edu.au). On Monday 25 February, all Year 8 students participated in a study skills seminar where they learned key skills including note-taking, dynamic reading, mind mapping techniques and self-directed learning. The student activity pack, which accompanies the manual the boys were given, can be found here. Students are encouraged to use this activity pack to reinforce what they learnt at the seminar. The Term 1 report will contain teachers’ ratings of your son’s work practices, as well as a grade and mark. Trimesterised (Science) subjects will only be reported on in the terms that the trimester is completed. Any queries about these reports should be directed to your son’s tutor when school resumes. The Parents’ Association invites all Year 9 parents to an information evening and sundowner on Thursday 9 May in the School Refectory. The Director of Outdoor Education, Ryan Myles will provide parents with an overview of the Year 9 camp program followed by an opportunity to catch up with other parents while enjoying drinks and canapés. On Monday 18 March, all Year 9 students participated in a study skills seminar where they learnt key skills including Creating a Study Routine, Prioritising High Value Tasks and Creating an Assessment Planner. The student activity pack, which accompanies the manual the boys were given, can be found here. Students are encouraged to use this activity pack to reinforce what they learnt at the seminar. Year 9 students will be sitting the NAPLAN paper tests on 14, 15 and 16 May 2019. Please find more information about NAPLAN here. Is your son considering his university options but unsure of the right degree? Notre Dame’s advisors can introduce him to a range of programs that align with his strengths and interests to help him find the right degree. He can also take a campus tour with one of their Student Ambassadors. When you think critically and see the world from multiple points of view, you have the power to solve the world’s biggest problems. Drop in to explore info sessions, enjoy a hot chocolate, chat with academic staff and NDA students, and to find out how a Notre Dame education will equip your son with the skills to navigate a future that hasn’t even been dreamt of yet. It’s time to choose your path for Year 11 and 12, but what’s the right choice? Students in attendance will hear more about Notre Dame’s recommended subjects and pathway options. Find out more and register at notredame.edu.au/events. Parents may wish to note that this presentation will take place at 6.30pm on Wednesday 29 May. The Year 10 interviews are scheduled for Monday 1 July from 3.45pm to 7.00 pm. Parents will be advised of the booking process by email approximately ten days before the interviews. The timetable and examination rules have been made available to students and can be found here. Please click here to see the presentations from the Year 11 Ad Astra day on Wednesday 13 February. The Director of Studies addressed Year 11 parents on Wednesday 13 February. Please click here to see the presentation slides from the evening. Discover Your Future in Health showcase is now open for registrations and students are encouraged to either attend in person (to see the facilities in the Adelaide Health and Medical Sciences building) or access the information sessions via their Facebook live option. The event will be useful for any students interested in tertiary study in 2020 in the areas of dentistry, health and medical sciences, medicine, nursing, oral health or psychology. The Admissions Guides for the Bachelor of Medicine and Bachelor of Surgery, Bachelor of Dental Surgery and Bachelor of Oral Health are now available online. There are separate international and domestic versions to make it easier to differentiate the relevant information and provide a clear path to understand the admissions requirements. Prior to the Principal’s Dinner on Wednesday 1 May, Year 12 Portrait Photos and Year 12 Group Photo sessions will take place. This year the photo sessions are different to normal and we have chosen to combine two photo sessions for Year 12s to reduce the impact on academic time in 2019. Portrait Photos – 3.20 pm to 4.30 pm, with photos taken in House groups in the photo studios set up in the Refectory. Group Photos – 4.45 pm to 5.45 pm – with the “Class of 2019” year photo as the first item, followed by Year 12 House group photos. The portrait photos will be used for Valedictory Night, Mitre Yearbook 2019 and the Leavers book, so we expect students to make every effort to be properly presented for the photo sessions. These photos will be available for purchase and Photo Order Envelopes, with relevant information, will be distributed to Year 12 students to pass on to their parents. Advance notice to parents of all boys completing Year 12 General courses: these courses require us to run some testing in the first part of Term 2 (Week 4 – otherwise a non-assessment week). Students will be given plenty of notice of the precise schedule and the nature of the tasks, which will be set by the School Curriculum and Standards Authority. There is just one task of 50 minutes for each subject. Each task accounts for 15% of the year’s marks and will be used by SCSA to ensure consistency of marking across the state. More information will be available early in Term 2. The School Curriculum and Standards Authority (SCSA) has released this year’s Year 12 Information Handbook (Part 1). It contains important information for all students working towards the WACE. The handbook is in two parts; the second part will be released in July. All Year 12 students (and parents) are encouraged to download and read the handbook. This event is specifically designed to provide better insight into the Melbourne experience for interstate students. Those interested are encouraged to register early as places are limited. Year 12 is a fast and frenetic year – it is very helpful if parents, as well as boys, are aware of key dates. They can be found here. Please take particular note that if your son is studying a subject with a practical exam, he must be available during the Term 3 holidays for this exam. The School Curriculum and Standards Authority issues these exam times and will not make alternative arrangements where the times are deemed inconvenient by parents, except in the most urgent and unavoidable circumstances. They also do not accede to parents’ requests for particular dates and times. In short – please do not make any plans to travel interstate or overseas with your son during the Term 3 holidays! The Director of Studies addressed Year 12 Parents on Monday 4 February. Please click here to see the presentation slides from the evening. Fire Tech is Perth’s leading provider of creative and technical workshops covering topics including coding, building and flying drones, mastering Minecraft, stop motion animation and digital music production. More information, prices, booking information and workshop dates and times at firetech.wa.edu.au or this flyer.